Some hot Jupiter alien planets orbit in a direction opposite to the stellar rotation. This can be caused by gravitational perturbations of another hot Jupiter in the system (shown in upper left). Scientists have a new explanation for the mystery of why some alien planets the size of Jupiter or larger travel in the opposite direction of their parent star's spin. Of the more than 500 alien planets that have so far been discovered, many have turned out to be oddballs. 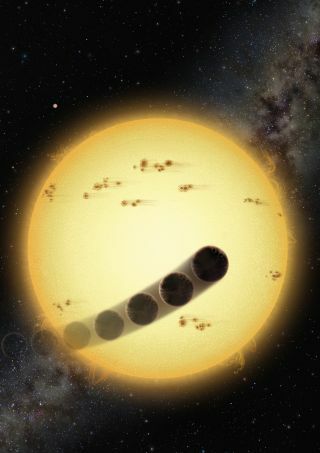 Scientists have found planets with extremely elongated or highly tilted orbits, or planets that follow paths that swing in very close to their parent stars. The cream of the weird planet crop are so-called hot Jupiters— large gas giant planets that circle extremely close to their stars — that seem to orbit around their stars in the opposite direction of their parent star's spin. About a quarter of all hot Jupiter planets discovered by astronomers seem to be these strange backward-traveling worlds. A flipped hot Jupiter is unexpected based on scientists' understanding of how planets form. The basic idea is that a cloud of matter collapses and condenses into a star, which will be surrounded by a large, flat disk of residual gas. Planets then form out of this disk. "Because all of this comes from the same initial swirling cloud of gas, very naturally the picture is one in which the star is spinning, and everything around it is spinning in the same direction," said astrophysicist Frederic A. Rasio of Northwestern University in Chicago. Rasio is the senior scientist on a team led by Northwestern University postdoctoral fellow Smadar Naoz that solved the riddle of these strange systems. The research is detailed in the May 12 issue of the journal Nature. The researchers suspect that flipped hot Jupiter planets start out in normal orbits that are slowly distorted into strange ones. That means the giant planets form farther away from their stars, just like Jupiter in our own solar system, and then somehow get kicked in closer. "There aren’t many things that can change the orbit of a big planet like that so drastically," Rasio told SPACE.com. "The candidates are pretty obvious, and the one we looked at is to simply have another big planet in the system farther out." The researchers used computer models to calculate what would happen to the orbits in a planetary system with two large gas giant planets on its outskirts. "Through a sequence of steps that are well understood and happen naturally, we end up with exactly the kinds of things we are seeing," Rasio said. What happens is that the two planets interact gravitationally. Sometimes, the orbit of the inner of the two gas giants slowly becomes elongated, almost to a needle-shaped path. Then, when the planet reaches the point in its orbit where it swings very close to the star, the star and the planet begin to interact tidally. This tidal squeezing is like friction, dissipating energy and causing the planet's orbit to shrink. Sometimes, while this process is happening, the orientation of planet's orbit can be shifted so it's not in the same plane as the other planets. Occasionally, the orbit can be changed so much it completely flips around. "We saw this for the first time because we did the calculation much more carefully than people had ever done before," Rasio said. "The basic physics is just Newtonian mechanics. All of that comes out naturally of simply calculating these very tiny gradual changes that build on."